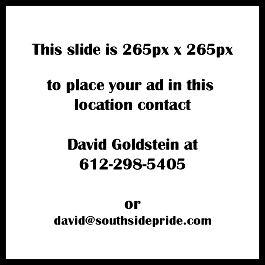 editor@southsidepride.com Southside Pride is a free monthly newspaper locally owned and operated in South Minneapolis serving the following neighborhoods: Elliot Park, Phillips, Corcoran, Bancroft, Bryant, Central, Powderhorn Park, Standish, Regina, Diamond Lake, Wenonah, Morris Park, Minnehaha, Ericsson, Field, Page, Keewaydin, Northrup, Cedar-Riverside/West Bank, Seward, Longfellow, Cooper, Howe, and Hiawatha. The total circulation per month is 46,500, making Southside Pride the largest community newspaper in the Twin Cities. We are proud of the racial and cultural diversity of the Southside, and we oppose racism and other efforts to keep us apart as a community. Southside Pride – Riverside Edition is a monthly newspaper delivered on the third Monday of the month from Cedar-Riverside in the north to Minnehaha Falls in the south, and from Hiawatha Avenue in the west to the Mississippi River in the east. We publish 14,000 papers each month, which are delivered door to door and to local businesses.